The Disneyland Hotel Paris is at the gates to the Park and one of the most expensive. 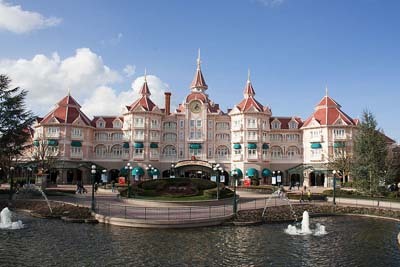 It is also one of the most popular Eurodisney hotel at euro Disney France. If you have the money, this is the place to stay. It is the only luxury Eurodisney hotel and the only one within walking distance to the Parks and Disney Village (an entertainment complex). This is the place to stay for the perfect Euro Disney France location. And the two restaurants are highly rated by visitors. For Disneyland Paris breaks in price ask for tickets to the Parks included in the hotel fee. This Disneyland hotel is 4 star luxury in lavish Victorian style. Rooms in the back overlook the Sleeping Beauty Castle and Big Thunder Mountain in the Park. There are 496 guest rooms. All guest rooms include bathrobes and free toiletries, cable TV with the Disney Channel and storytelling on the radio (in French). Amenities include Eurodisney Hotel FASTPASS for all guests (you can make reservations for rides so you don’t have to stand in line), a "Meet‘n'Greet" where your kids can meet some of their favorite Disney Characters and have fun with various activities in the children's playroom. An indoor swimming pool, jetted tub, sauna, steam bath and fitness rooms, and free parking. The Castle Club is an extra luxury section of the hotel with rooms, private lounge with daily breakfast with Disney characters, drinks and tea at teatime. There is a private elevator, which takes you down to the entrance to the Park. The two restaurants California Grill and Inventions are considered the best in the park. Breakfast: Free Continental buffet breakfast every morning. California Grill is refined dining with great views over Disneyland. Inventions offers a buffet of international cuisine. Big windows give you sweeping views of Disneyland. At night the Disney characters are there interacting with the diners. Café Fantasia, a lounge offers drinks plus piano bar at night. Disneyland Hotel Paris is one of seven Disneyland Paris hotels in Marne-la-Vallee, France owned by Euro Disney France (the corporate parent that operates Disneyland Paris) Check out the other Disney owned Disneyland Paris hotels. Other Popular choices include a Eurodisney hotel in partnership with Disney near the Parks and less expensive. 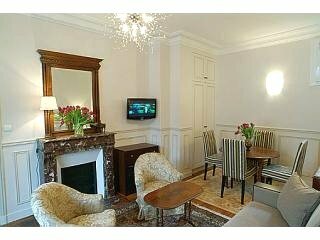 For a cheap holiday to Disneyland Paris stay in one of the budget hotels and motels in France only 20 minutes away. Euro Disney France is one of the most visited tourist destinations in France. Don’t miss out on seeing the other top tourist destinations in France many of which are in Paris or nearby.